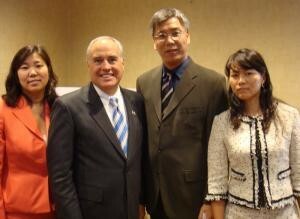 The New York State Comptroller Thomas P. DiNapoli came to Flushing on the morning of Sept. 22nd. The vice comptroller Kenneth B. Bleiwas, New York State congressman Grace Meng, and the president of queens country Mr. Marshall etc. also presented at the lecture. Flushing is located at north central of the Queens, established in 1645. It is the first area for permanent residents in Queens, embracing rich religious culture and history. Although the U.S. economy was greatly affected by economic crisis in 2008, the economy growing rate in Flushing is keeping increased. From 2000 to 2009, the number of enterprises in Flushing had grown 37.6% while other areas in New York City only grew 5.7%. Since 2005, people who worked in Flushing have grown year by year. Since more than half number of enterprises are small businesses, its expansion speed is far faster than those from the other areas. Flushing has convenient transportation. There is LIRR, 21 MTA buses, and LaGuardia airport nearby. Mr. DiNapoli pointed out that the immigration people in Flushing is the main reason that the economy grew. Other boroughs should learn from Flushing. Meanwhile, Flushing stimulated its surroundings economically.